Given their habitually quick responses to the injustices of oppressive regimes, the discretion of French officials in their reaction to the escalating violence in Tunisia is striking some observers as curious indeed. And Paris' cautious positioning towards its former North African colony doesn't look likely to change anytime soon. On Tuesday, as clashes between protesters and police reached the Tunisian capital Tunis for the first time since riots began nearly a month ago, most discussion in France focused more on whether or not Tunisia's authoritarian President Zine El-Abidine Ben Ali can be called a dictator, and less on the rising death toll among Tunisians protesting his hard-line rule. "Rather than issuing anathemas, I believe our duty is to make a calm and objective analysis of the situation," French Foreign Affairs Minister Michèle Alliot Marie told parliament Tuesday, responding to suggestions from pundits that Paris had shrunk from calling Ben Ali to task for deploying the army against protesters. "We must not stand out as lesson-givers." "It's not to me to judge the Tunisian regime," French Agriculture Minister Bruno Le Maire told French TV channel Canal Plus earlier on Tuesday. "President Ben Ali is someone who's frequently judged badly, [but] he's done a lot of things." A valorous attempt at simulated praise by Le Maire, but given Ben Ali's reputation as an iron-fisted leader who tolerates no dissent at home  and little criticism from abroad  that sort of mincing of words from French officials has struck many observers as shameful, if not complicit in the ongoing repression that has claimed 23 Tunisian lives according to official reports (50 or more, according to human-rights groups). It also contrasts the pointed and repeated denunciations from Paris of other regimes engaged in troublesome behavior elsewhere in the world. The French rarely hesitate to loudly lament the smothering of opposition in Iran, Burma, and North Korea, for example, and continue to push Ivory Coast President Laurent Gbagbo to step aside after losing an election he contests. But when it comes to staunch allies like Ben Ali getting rough with their people, Paris tends to get tight-lipped and look for excuses. "To say unequivocally that Tunisia is a dictatorship strikes me as completely exaggerated," Culture Minister Frédéric Mitterrand told Canal Plus on Jan. 9, bucking widely held views around the globe to the contrary. Those views were clearly expressed in a recently released WikiLeaks cable from the U.S. Embassy in Tunis. Dated 2009, it described Ben Ali's Tunisia as "a police state, with little freedom of expression or association, and serious human-rights problems." Since Dec. 17, nationwide demonstrations have seen millions of Tunisians defying the armed forces while protesting a lack of jobs, freedoms, and civil liberties. Though long compelled to accept Ben Ali's China-like social contract  ie. minimal political rights in return for relatively robust economic activity  Tunisians are pushing back in anger now that the nation's employment market has been swamped by a glut of younger people looking for work. They're also enraged at the regime's alleged graft, which the WikiLeaks cable characterized as "corruption in the inner circle [that's] growing." In light of the clashes on Wednesday between Tunisian army and police patrols and participants in the first full-fledged protests in the heart of Tunis, the cables turns out to have been prescient in warning that oppression, vice and economic mismanagement mean "risks to the regime's long-term stability are increasing." Apparently wary of that, Ben Ali responded to Wednesday's violence by firing his interior minister and promising the speedy release of people arrested during recent demonstrations. Paris isn't blind to the warning underlined in the 2009 cable, but for now wants to avoid further undermining Ben Ali by criticizing his management of events. 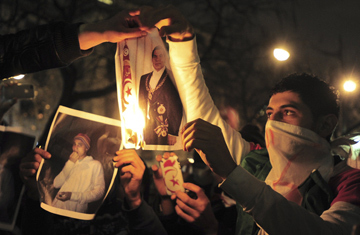 In addition to political cynicism, deep Franco-Tunisian history is at work. Many French families have roots in colonial and post-independent Tunisia; Paris Mayor Bertrand Delanoëand French Secretary of State of Foreign Trade Pierre Lellouche are among the tens of thousands of French citizens who were born there. And despite angry responses by rightists to those who over the years have apologized for France's colonial period, ruling conservatives  who in 2005 passed a swiftly repealed law requiring schools to teach the "positive role of the French presence abroad, especially in North Africa"  now would rather not appear to be intervening in the affairs of an ex-protectorate. Meanwhile, there are other reasons that French officials have rationalized Ben Ali's strong-arm regime over the years, and that now make criticizing him a delicate issue. The Tunisian president's 23-year hold on power has made him a stable partner in a region critical to a vast range of French interests. Ben Ali's iron rule, moreover, has helped him prevent Islamist extremists from operating in Tunisia as they have with far more success in Algeria, Morocco, and the Sahel region. "It's a matter of fact that one upside of Ben Ali's dictatorship has been the relentless squeeze it's put on jihadists," says a French security official, who notes that extremists have repeatedly tried  and failed  to construct networks and training areas in Tunisia and near its borders. So while Paris habitually supports those who take to the streets during conflict situations in other countries, it's likely to remain relatively quiet when the public rises against its friends in Tunisia.